RCS II, Inc. has discovered a technology that will change the way people maintain the biological health of their septic systems. 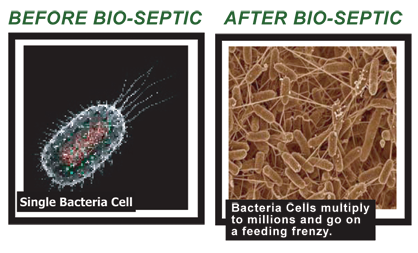 Did you know there are millions upon millions of strains of bacteria today? Picking the right bacteria for the millions of different environments is a difficult task. There are a few quality companies that produce quality Aerobic Bacteria that fit well in the septic environment, but that’s a few out of 2,100 bacteria suppliers in the United States and Canada today. We have chosen a completely different approach to maintaining the biological health of your septic system. Some thirty years ago at the University of Hawaii (UH) a technology was discovered while trying to find a better way to grow Pineapples. UH discovered what they called a biological nutrient stimulant that is all natural and could increase the metabolic reproduction rate of naturally occurring bacteria by a million fold. In the pineapple experiment the scientists wanted to find a way to speed up the breakdown of organic material to better enrich the soil. This breakthrough technology is used worldwide in municipal and industrial treatment plant processes, golf course green management, and other agricultural industries to increase bacterial growth, which in turn breaks down organic matter eliminating organic material and enriching the nutrients in soil. Finally a product that will help protect your system from Chemical Therapy (CHEMO) attacks because we all know someone has been stricken by cancer. A small amount of this product will save homeowners the need to buy those bacterial additives in super markets. I look forward to seeing you as a future customer using Bio-Septic Boost or Septic Drainer.